Quinoa, a grain like seed is a complete protein, unlike rice or beans. It is also gluten free. It is the best source for a plant based protein and being high in fiber and iron it should have a place in every vegetarian kitchen. 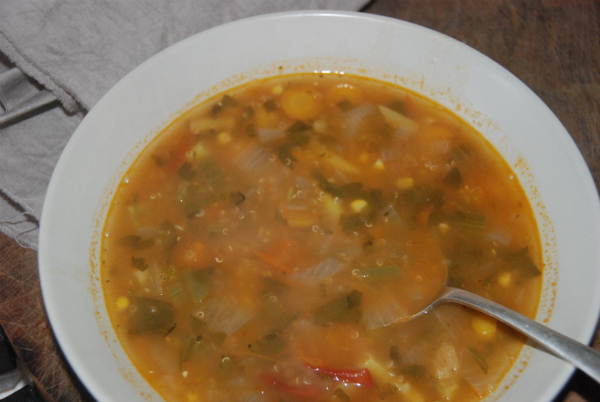 Sopa de quinoa is a staple soup in Peru. The Andes is where this grain thrives. Quinoa is cooked with potatoes, onions and garlic in lard or oil and flavored with native oregano and annatto seeds. Whatever vegetables or greens are at hand are added to the soup. The soups I had ranged from a clear pale yellow soup to a thick creamy one, chock full of vegetables and greens.It usually served with an aji made from chili peppers. You can take one slice from a chili and float it in your bowl of soup until you have the desired heat you like. Method 1. Combine carrots, onions and celery in a heavy bottomed soup pot with a splash of olive oil. Gently fry until the onion is translucent. 2. Add pumpkin, potato, quinoa and stock. Bring to a boil then reduce to a simmer. Continue to simmer until the vegetables are tender and the quinoa has "split", the curly tails have removed, about 10-15 minutes. 3. Adjust the seasoning with additional salt, if necessary and add the fresh herbs. Cook 2 more minutes, then remove from the heat.